Facebook is the beginning and the end of the internet for a huge number of normal people, a combination of primary service provider (user profiles, messaging, photo sharing) and ’90s-style portal to the wider web. Facebook has its own IM platform, Messenger, just like AOL had AOL Instant Messenger. This has so much truth in it, it makes me sad and gives me hope – hope because like AOL, maybe Facebook will actually be replaced some day. I joined Facebook in it’s early days of public access, when it was fun, interesting, and social. Anyone who was around then, and still uses it now, will likely agree – Facebook isn’t what it was. I do think it was successful in bringing people together but I think Facebook has basically lost it’s way. Out of frustration of what Facebook is now, I have started to create some new habits for myself that so far – are working. 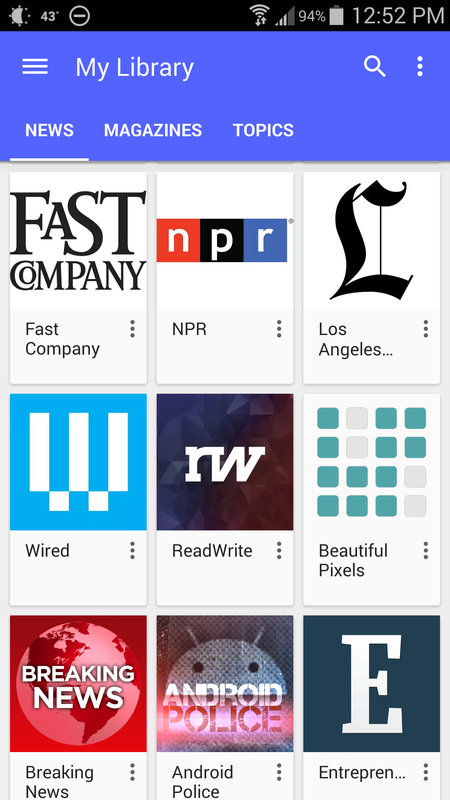 Instead of beginning the day with Facebook for news (which no longer appears in my News Feed unless the posts are sponsored), I now reach for my Google Play Newsstand. Google Play Newsstand is an Android App. where I can see highlighted news I from sources I have selected. Unlike RSS, you aren’t able to add your own preferred feeds, but it’s a great starting point with a lot of fantastic news sources that cover news, business, entertainment, sports, and more. If you use Android, I highly recommend taking a look. After browsing through Google Newsstand, I’ll often check out Reddit where I view internet cultivated news, learn new things, and get book recommendations (here, here, and here). It took me quite a while from the time I first learned about Reddit, to where I actually began to use it. Granted, they could use a nicer looking design, but the site functions well and their voting system works more or less as intended. On Reddit, the more popular posts get voted up, and become easier for you to find. And no matter what your interests are, you’ll be sure to find a subreddit that exists – just play around with the search box. All in all, my biggest motivation is to use Facebook only occasionally, rather than often. There are better ways to find out what’s going in the world, and someday, I hope there will be better ways to connect with friends, perhaps even here within the WordPress community. How about you? Do you still find Facebook serves it’s purpose as a tool to connect with Friends? Is it more social, or anti-social in your life? Oh I keep forgetting about Flipboard! I like that resource as well.